NEW ORLEANS (AP) As quickly as Golden State’s Klay Thompson pulled up for his seventh 3-pointer of the night, the Pelicans’ packed, home-opening crowd stopped chanting, ”Defense,” and started looking for the nearest exits. Thompson scored 31 points, Stephen Curry added 28 and the Golden State Warriors easily erased a 15-point first-half deficit en route to a 128-120 victory over the New Orleans Pelicans on Friday night. Kevin Durant added 22 points and a career-high seven blocked shots for the Warriors, who won for the first time this young season after dropping their opener to Houston. New Orleans is still looking for its first victory after two games, shooting well early in both contests before fading in the second half. Despite the loss, coach Alvin Gentry and several Pelicans players felt their play improved against the defending champion Warriors and left optimistic about an upcoming West Coast trip. The teams combined for 34 3-pointers, with the Warriors hitting 18. Thompson, his quick-release perimeter shooting on full display, was 7 of 12 from deep. The Pelicans, who wound up trailing by double digits much of the fourth quarter, pulled as close as five points on Cousins’ 3 with about three minutes to go. 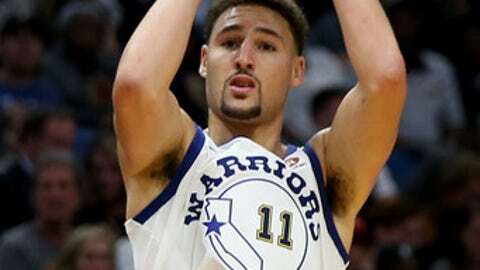 But Thompson responded immediately with a 3, after which Golden State remained comfortably in control. Warriors: Curry reached 3,927 assists, passing Tim Hardaway for second place on the franchise’s assists list. … David West, who was New Orleans’ first-round draft choice in 2003 and spent his first eight NBA seasons with the franchise, received polite applause after scoring his first points on a mid-range jumper. He followed that up with a 3-pointer shortly after and finished with 11 points. Pelicans: G Ian Clark had 14 points, while Jrue Holiday and Jordan Crawford each added 13 from the back court. … Gentry was assessed a technical foul by official Ed Malloy in the second quarter. … The Pelicans announced that C Alexis Ajinca would miss four to six weeks following successful bilateral knee injections to treat patellar tendinitis. … New Orleans shot 50 percent from 3-point range in the first half, hitting 11 of 22, but made just five of 14 from deep in the second half. Golden State closed out the half with a 19-7 flourish, capped by Durant’s 3 that made it 64-61 at halftime. That turned out to be part of a 26-7 run that gave the Warriors their first lead in the third quarter. Durant scored two points and blocked two shots by Tony Allen during a short stretch in which he played with only one shoe after the other had fallen off right before he hit a layup. Durant and Curry grinned as they watched a replay of the sequence in the locker room. Green, who scored 10 points, was assessed a technical foul after shoving Cousins in the second quarter. But Green stressed that Cousins is ”my guy” when they’re not competing. ”We won a gold medal together so that’s a relationship that will be there for a lifetime,” Green said.